At Dallas Podiatry Works, our Dallas, TX, foot specialist focuses on advanced modern-day medicine, making traditional x-ray imaging a thing of the past. Conventional X-ray imaging uses photographic film to produce images, but cutting-edge digital radiography uses sensors to scan the subject and produce an immediate image. Many medical professionals prefer this method over the traditional method because it offers numerous advantages. Not only does digital radiography provide instant results, but it also allows the images to be digitally saved, transferred, and enhanced. In addition, less radiation is used to produce a digital image than with a conventional x-ray image. Digital radiography bypasses traditional x-ray imaging by using a digital image capture device. This allows your Dallas, TX, foot specialist to preview an image and immediately save, transfer, or enhance the image as needed. Another bonus is the elimination of expensive film and costly processing techniques. Digital radiography also offers a wider dynamic range, which produces higher quality images and reduces the chance of under or over-exposure. Call for an Appointment with Our Expert Dallas, TX, Foot Specialist Today! 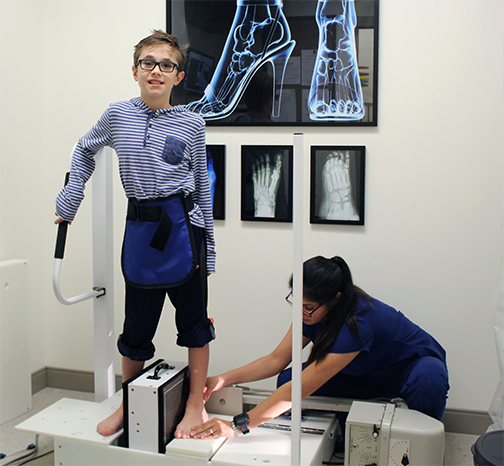 For the best Dallas foot care in our state-of-the-art podiatry office, call 972.566.7474 or click here to schedule your appointment with our Dallas, TX, foot specialist. Our podiatrists and staff are always ready to help you put your best foot forward!